The Luray Triathlon is gearing up for our 12th Annual event on August 19 and 20, 2017 and we need you! This two-day event requires over 300 volunteers and I hope that you are able to help again this year. Volunteers help with everything from registration, to safety on the water, to handing out water, to directing runners and cyclists, and much more. We would not be able to host an event this size without all of you, our dedicated volunteers. All Voluteers will recieve a free t-shirt. 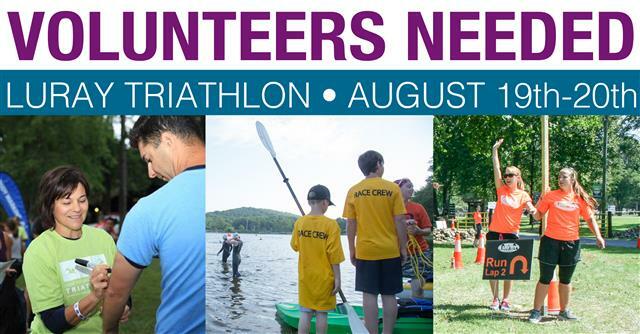 By volunteering for the 12th annual Luray Triathlon you are helping to support the United Way of Page County. United Way of Page County is helping us to recruit volunteers and the Luray Triathlon is pledging a donation in return. Last year Luray Triathlon gave over 11,000 to United Way of Page County. PLEASE DON’T DELAY, REGISTER AS SOON AS YOU CAN TO HELP US WITH OUR PLANNING.